With the new port mobile crane from the Straubing crane manufacturer, port operators are given a new, high-quality alternative for container handling on the market. Similarly, the mobile port crane shall present an interesting solution for all ports which handle mass or general goods with ships up to around 100,000 DWT. The 9300 E is an especially interesting solution for river and inland ports and large central transshipment points, to which smaller ships are transferred. 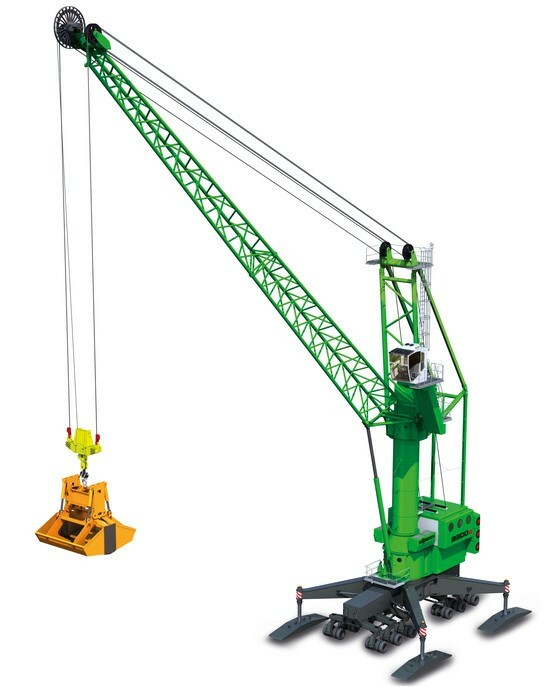 With more than 65 years of experience in the design and development of cranes and duty cycle cranes, SENNEBOGEN is one of the world's leading manufacturers in material handling and crane technology. With its completely newly developed 9300 E port mobile crane, the Bavarian crane manufacturer is expanding its extensive portfolio with an attractive machine for the growing market in mass, general and container handling. The machine's high performance allows universal uses for effective handling in the port. The 9300 E from SENNEBOGEN has an easy to maneuver mobile undercarriage and boasts a large, stable outrigger area. With its large reach, feeder and standard ships are handled in container handling as well as Handysize ships for bulk cargo handling.